Midland University’s Phi Beta Lambda chapter was heavily involved in this year’s Career and Internship Fair. The event was located in Midland’s Event Center on Wednesday, February 15, from 10:00am – 1:00pm. 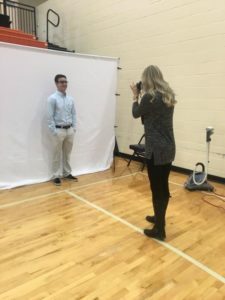 During the Career Fair, PBL members, Jesica Neal and Myles Shonsey took free professional photos for Midland Students to use on LinkedIn profiles and job searches. By the end of the Career Fair, 220 Midland students had their pictures taken. In addition to PBL’s photo station, over seventy businesses from the Fremont and Omaha area set up information booths and interacted with students about career and internship opportunities in their fields of interest. The success of this event is not only measured in student attendance and the amount of community members involved, but in the networking connections that were formed. The doors of opportunity that were opened through this fair will impact future generations and will pave the way for increased opportunities for students following their time at Midland University.